Wide-ranging National Institutes of Health grants announced today will develop new strategies to analyze and leverage the explosion of increasingly complex biomedical data sets, often referred to as Big Data. 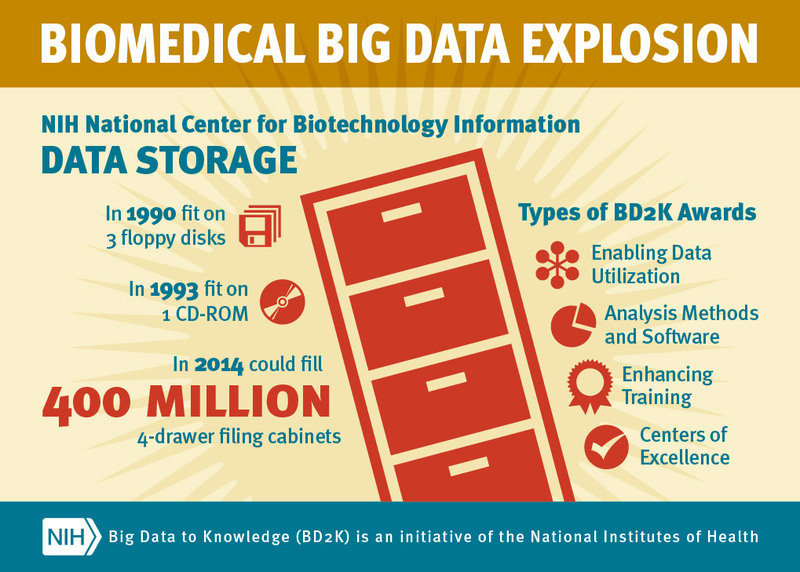 These NIH multi-institute awards constitute an initial investment of nearly $32 million in fiscal year 2014 by NIH’s Big Data to Knowledge (BD2K) initiative, which is projected to have a total investment of nearly $656 million through 2020, pending available funds. With the advent of transformative technologies for biomedical research, such as DNA sequencing and imaging, biomedical data generation is exceeding researchers’ ability to capitalize on the data. The BD2K awards will support the development of new approaches, software, tools, and training programs to improve access to these data and the ability to make new discoveries using them. Investigators hope to explore novel analytics to mine large amounts of data, while protecting privacy, for eventual application to improving human health. Examples include an improved ability to predict who is at increased risk for breast cancer, heart attack and other diseases and condition, and better ways to treat and prevent them. The funding will establish 12 centers that will each tackle specific data science challenges. The awards will also provide support for a consortium to cultivate a scientific community-based approach on the development of a data discovery index, and for data science training and workforce development. Studies generating large amounts of data continue to proliferate, from imaging projects to epidemiological studies examining thousands of participants to large disease-oriented efforts such as The Cancer Genome Atlas, which examines the genomic underpinnings of more than 30 types of cancer, and the ENCODE Project, which seeks to identify all functional elements in the human genome. Such efforts have generated billions of data points and provide opportunities for the original researchers and other investigators to use these results in their own work to advance our knowledge of biology and biomedicine. Dr. Bourne, in calling for the establishment of a “digital ecosystem” for biomedical research, said that the new BD2K programs are at the forefront of NIH’s efforts to increase the efficiency and cost effectiveness of scientific discovery. Challenges in making the best use of such biomedical information are many. They include problems of locating data and the appropriate software tools to access and analyze them, lack of data standards for many types of data, and the low adoption of data standards across the research community. There is also a need for new policies to facilitate data sharing while protecting privacy. A lack of standards and an unwillingness to make data available to colleagues hampers efforts to make data fully useful to the broad research community. Large data sets are relatively expensive to generate and the return on investment increases when they are shared and used widely. Many scientists also do not have the opportunity or facility to use big data. While teams at large research universities and academic medical centers may have bioinformatics and data infrastructure, individual scientists in the biomedical research community may not. Regardless of their research facilities, many scientists have not been trained in the computational skills to access and analyze large data sets. Centers of Excellence for Big Data Computing. These 11 centers will develop innovative approaches, methods, software, tools and other resources. While the development efforts will focus on specific research questions, their output is expected to be more generally relevant to various aspects of big data science, such as data integration and use, analysis of genomic data and managing data from electronic health records. BD2K-LINCS Perturbation Data Coordination and Integration Center. This center will be a data coordination center for the NIH Common Fund’s Library of Integrated Network-based Cellular Signatures (LINCS) program, which aims to characterize how a variety of types of cells, tissues and networks respond to disruption by drugs and other factors. The center will support data science research focusing on interpreting and integrating LINCS-generated data from different data types and databases in the LINCS-funded projects. This center is co-funded by BD2K and the NIH Common Fund. BD2K Data Discovery Index Coordination Consortium (DDICC). This program will create a consortium to begin a community-based development of a biomedical data discovery index that will enable discovery, access and citation of biomedical research data sets. Training and Workforce Development. These awards support the education and training of current and future generations of researchers who will specialize in data science fields, as well as those whose work may require certain expertise in the use of or generation of large amounts of data and data resources. The BD2K initiative, launched in December 2013, is a trans-NIH program with funding from all 27 institutes and centers, as well as the NIH Common Fund. NIH’s effort is being developed in the context of a number of related projects elsewhere in the world, including those under development in the United Kingdom and Australia, and by the European Union. There is great interest in communication and collaboration among those involved in this international effort to enable scientists around the world to contribute to advances in understanding health and disease, and ultimately to improve diagnoses, treatment and prevention. For more information about the recipients of the new grants, please visit http://bd2k.nih.gov/FY14.html.